Before travelling to Uzès for two performances with Vox Luminis, the trumpet section (Russell Gilmour, William Russell and Gareth Hoddinott) rendezvoused at Gareth & Cecile’s holiday home in the Alps at Montgilbert in the Maurienne valley in the Savoie region. Meeting up a few days beforehand allowed us to travel via more convenient airports on both sides (avoiding Ryanair) and it enabled us to practice together and enjoy time in the Alps before driving to Uzès. 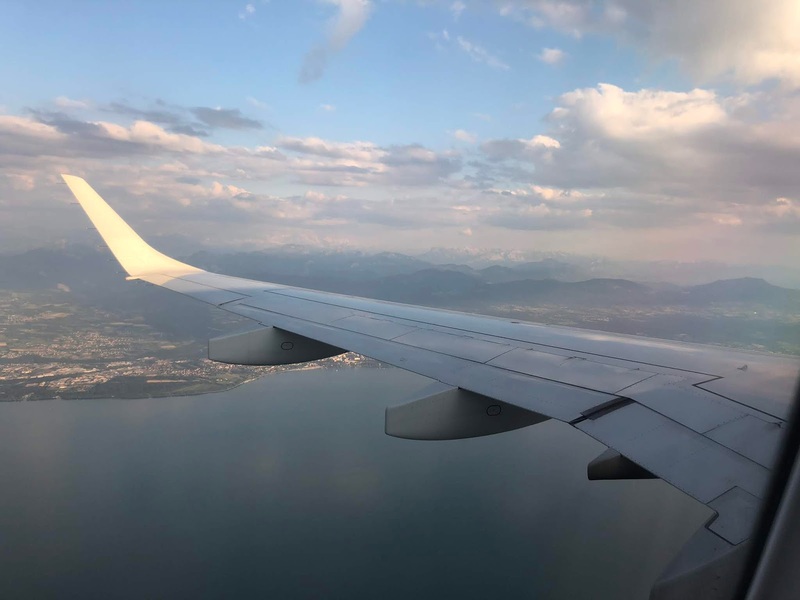 Will and I flew into Geneva airport, enjoying the scenic views of the lake before landing and meeting Gareth who would drive us to his place in the French Alps. 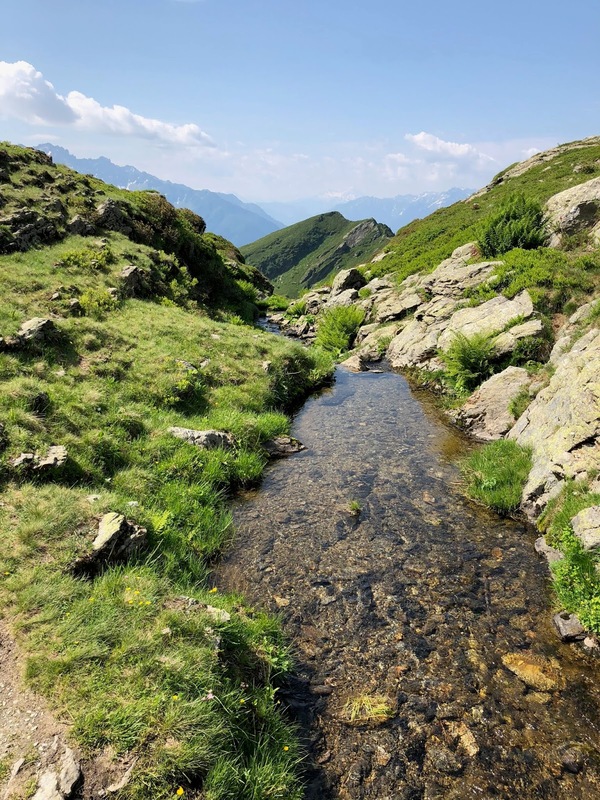 We had an amazing visit: enjoying local food, stunning views and an alpine walk - a demanding route (demanding for me at least, and certainly difficult because of the >30°C temperatures). The route went from Chenalet (1,670m) near the village of Montsapey up to the stunning Lac Noir (2,108m) near the summit of Le Petit Arc mountain (2,365m). On the descent we saw a Griffon Vulture soaring high above, gaining altitude with effortless grace. Even though seen from a distance, this was a magnificent sight. At first, I mistook it for an eagle. Griffon Vultures have 2.3m - 2.8m wingspan! (For comparison, an Albatross has the largest wingspan of any bird, typically measuring at 2.9m - 3.3m). After a great few days in the Alps, we drove 320km to Uzès, following the route of the river Rhône after Valence. The excellent weather continued throughout the week reaching temperatures typically around 33°C and even up to 36°C at one point. The hotel swimming pool provided respite from the heat and the rehearsals were warm but mercifully out of the direct blaze of the sun. 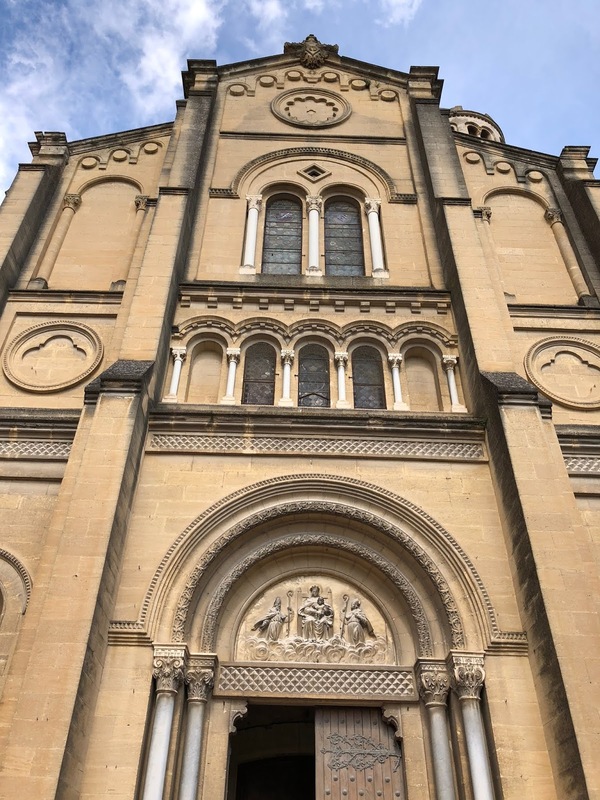 Uzès was a great place to spend time. We explored this fortified Roman civitas, and enjoyed the restaurants around the town centre. The evening market was a highlight with a great atmosphere. It was held in the square by the impressive Duché Palace and it featured food, drink and craft stalls and a beautifully-informal community-led dance (with quintessentially French music) in the courtyard of the Hôtel de Ville. 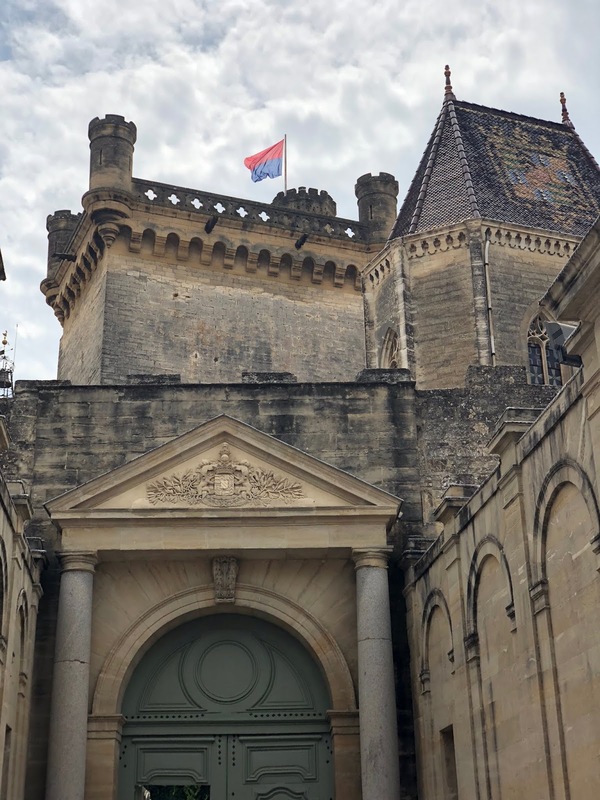 The Duché Palace, along with the Fenestrelle Tower of the Saint-Théodorit cathedral give Uzès a recognisable and ancient skyline. On one of the mornings off, we were able to visit Pont du Gard and swim in the river. Pont du Gard is the site of an an ancient Roman aqueduct bridge which spans 275m over the Gardon River near the town of Vers-Pont-du-Gard. 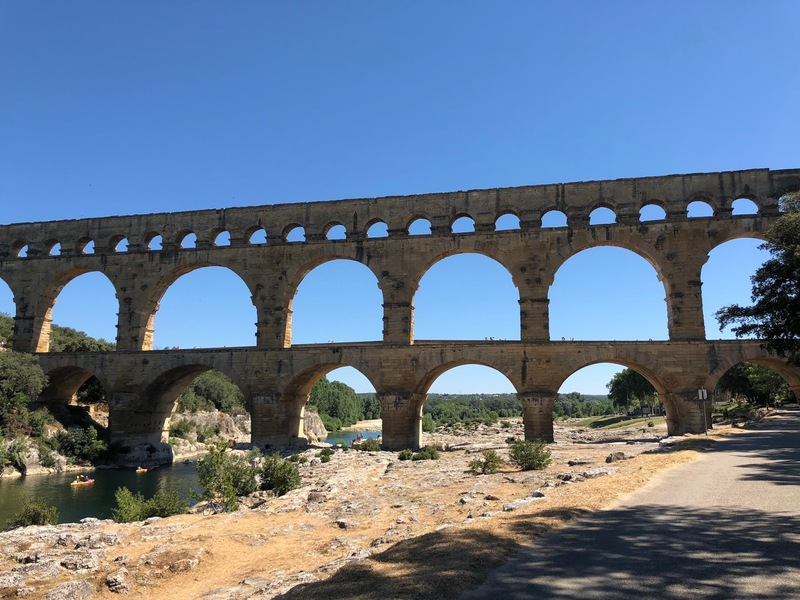 The entire Nîmes aqueduct system was constructed in the 1st Century AD and it channelled water for 50 kilometres from a source at Uzès to the town of Nîmes (Roman: Nemausus). It is the tallest aqueduct bridge that the Romans ever built and it is the best preserved example, and appropriately is on the UNESCO World Heritage list. The location, away from roads and other buildings, is well-preserved and the view around the aqueduct has changed little in the 2000+ years since its construction. 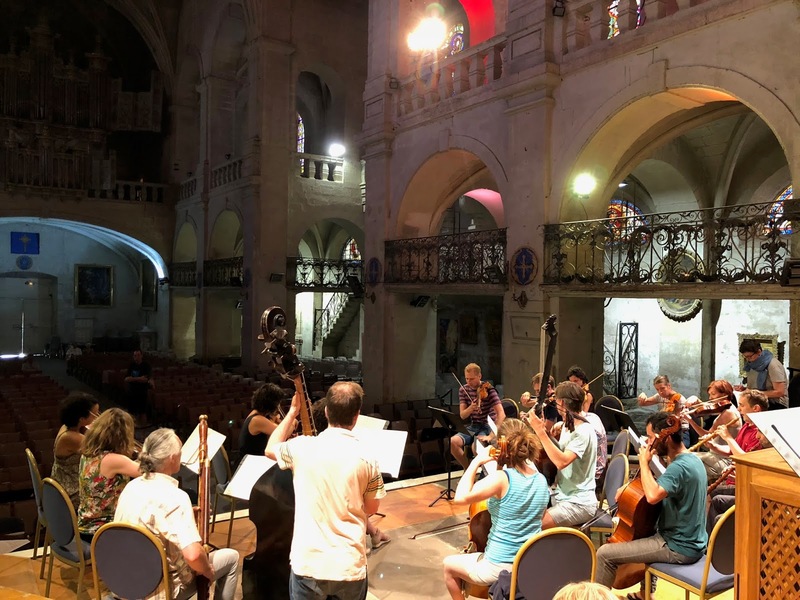 The international orchestra and choir of Vox Luminis (with their artistic director Lionel Meunier) performed two concerts at the Cathédrale Saint-Théodorit d'Uzès as part of the festival ‘48 Nuits Musicales d’Uzès’. The first concert featured Handel’s Dixit Dominus (HWV 232) and Handel’s Ode for St. Cecilia's Day (HWV 76). 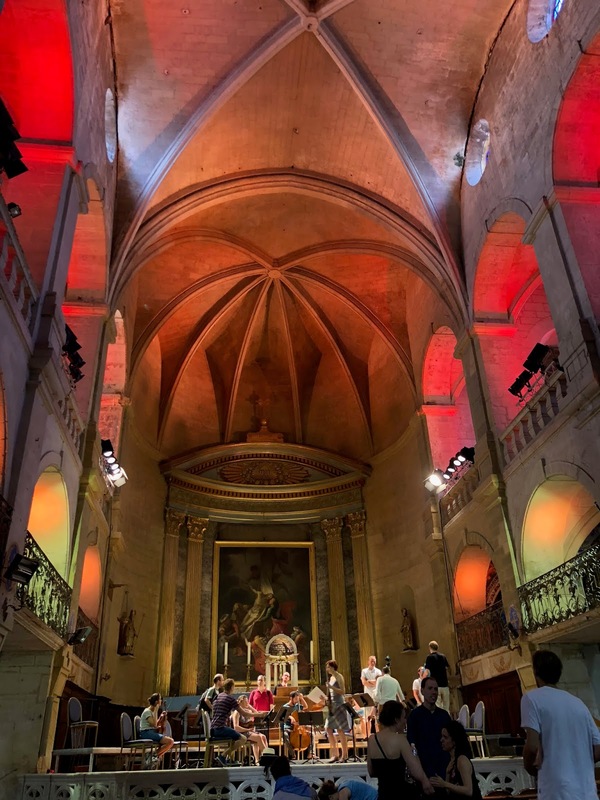 Moving from an all-Handel programme on Wednesday 18th July 2018 to an all-Bach programme on Thursday 19th of July 2018, the group performed the Missa Brevis in G (BWV 236) and the Magnificat in D (BWV 243) for a second performance in the 48 Nuits Musicales d’Uzès. Unfortunately, I only really heard the second half of each of the concerts as I was away from the stage during the Dixit Dominus in the Handel Concert and during the Missa Brevis in the the Bach concert. The opening Overture of the Ode for St. Cecilia's Day showed the quality of the strings (led by Tuomo Suni) and oboes (Benoît Laurent and Pedro Castro), before Robert Buckland (tenor) began with the recitative ‘From harmony, from heavenly harmony’. The refined chorus of Vox Luminis sang the following chorus ‘From harmony, from heavenly harmony’ with impressive class before the sublime Zsuzsi Tóth (soprano) sang ‘What passion cannot music raise and quell!’. The next movement began with an exposed natural trumpet interjection and a prolonged solo obbligato section over the words ‘The trumpet's loud clangour excites us to arms…’ sung by the magnificent tenor Robert Buckland. I had never played this piece before and it was great to play it with Robert at the front, and with fine timpani playing from Michael Juen alongside. Both concerts were a great success and were very well attended. The Handel Ode was a particular highlight for me as I had not played it before. Much like the Magnificat, the Ode with its varying instrumentation is dynamically interesting - and of course Handel’s Ode musically compliments John Dryden’s 1687 text. Speaking of John Dryden, the first two times I performed with Vox Luminis, the group performed Purcell’s King Arthur at Snape Maltings in Suffolk and later they recorded the same work in Antwerp. On those occasions both Robert Buckland and Zsuzsi Tóth sang significant solos: 'Come if you Dare' and 'Fairest Isle', respectively (and among others) and of course the words of Purcell’s King Arthur are also by John Dryden. Vox Luminis gave a great rendition of Bach’s Magnificat - with all the usual hallmarks of an excellent performance of it. Highlights came throughout the piece - ‘Et exultavit’ was expertly sung by Stefanie True, an excellent ‘Quia fecit mihi magna’ was sung by Lionel Meunier, ‘Esurientes’ was superbly rendered by the countertenor Alex Chance and accompanied by the excellent flautists: Jan Van den Borre and Katrien Gaelens. ‘Suscepit Israel’ featured the pure singing of Zsuzsi Tóth, Stefanie True and Alex Chance and the oboes played the cantus firmus with clarity. It was a great pleasure to play with Vox Luminis again and I look forward to our projects later this year. Thanks to all for an excellent trip and to those who helped to organise it.